Online shopping platforms have made the purchase of all gadgets very simple. The best thing about buying mobiles online is “Smartphone can be purchased after reading the properly designed features description which lists down all the specification of the phone in an organized manner. Also the interested buyer can check the unbiased review and ratings of gadget”. All the features at one page make it very easier to compare all selected phones, in order to make an intelligent choice. From launching its own tablet, to collaborating with Motorola for the sale of its smartphone series, Flipkart is doing all the right things being a leading e-retailer, when it comes to offer mobile phone choices. The page is most of the times flooded with offers to get the best possible deals. The various mobile brands available range from Nokia, Apple, Samsung, Motorola, Sony and a lot more. 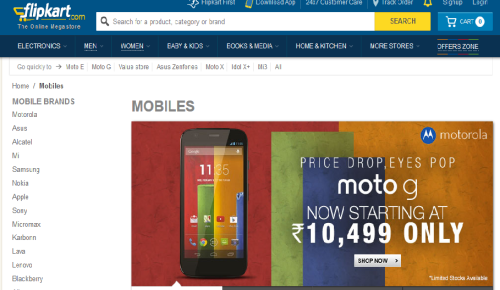 Ease of finding great coupon offers and deals for mobile phones on Flipkart is an added advantage for buyers and buyers can also visit couponzguru.com to get the best deal and offer on mobile phones. The well distributed categories include brands, offers, mobile type, mobile features and price range. Amazon is a great place to purchase mobile phones with lots of discounts. Attractive offers on the product page, makes Amazon one of the leading choices among number of online stores for mobile shopping. The category section includes the top searched mobile, the newest mobile phone, features, accessories, brands, prices and sellers. The range of brands and offers on the page is very attractive and the page layout makes it very easy to find the right phone with a very simple and convenient search process. 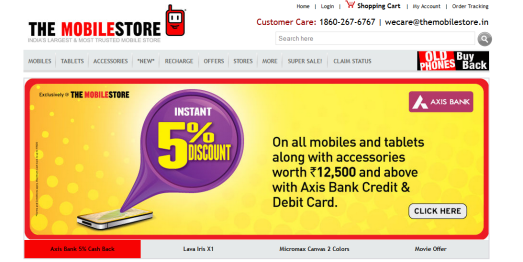 Homeshop 18 is one of the very trusted portals for checking and buying variety of mobile phones. The categories on the page include the price, type, discount, brand, operating system, and features. Look for some great coupons for mobile phones on this page and get the one which goes with your requirements the most at the best possible prices. Snapdeal offers a large variety of mobiles and mobile phone accessories to choose from. The page is known for its many different offers and coupons that keep being introduced. Categories on the page include specific details like brand, type, discount offers, price range, form, camera, operating system, features, RAM, screen size, and most importantly, some trusted user reviews which help buyers a lot in deciding. The Mobile Store is that one stop niche site for purchasing any kind of phone. The company provides multi brand phones and accessories in many different designs and features on a single page. With 800 offline outlets across the county, the online platform is making it a lot more lucrative for buyers and the organization alike. It is a simple website with easy to use, search facilities which is properly divided into categories like brand, type, features and body type. Offers in the forms of discounts are already available on the page and coupons keep popping up to add on to the best deals. Everyone is following the current shopping trend then why not you? Do let us know your experience with any of above sites. I think Amazon.in should be at the top of the list. Although Flipkart is also good, Amazon delivers products quickly and it is reliable. i want a coolpad note 5. only amazon has this phone but my city ranchi is not eligible for this product. from where can i get this phone now? Thanks for sharing your concern. The best possible way to get your phone is to tag Coolpad people on twitter and ask the question. That will be super helpful. One plus 3t is also not delivering in Itanagar by amazon. I don’t know why.. I would like to recommend you Get Better Offer is one of the best old selling cell phones website all in USA.